The Scoil Uí Chonaill Dinner Dance took place in Clontarf Castle on Saturday the 26th of January. The evening promised to be a sensational one, and it delivered. Club members of all ages came together to celebrate another fantastic year for our ever growing club. The event itself began in its usual fashion. Numbers still arriving as the meal was being prepared. Those who arrived early, however, enjoyed a refreshment and a conversation at the bar outside the main hall before everyone took their seats. Mossie O’Connell and Declan Hoban delivered the awards shortly after the meal, which was the focal point of the event. Beginning with the Ladies teams, Gus Rock helped give out the awards to the Ladies Player of the Year, Young Player of the Year, Mother’s and Other’s Player of the Year and Junior Player of the Year. Congratulations to Naoise Ní Bhroin, Hannah Leahy, Tara Galvin and Melissa Courageot, respectively. Shortly after were the men’s team awards. 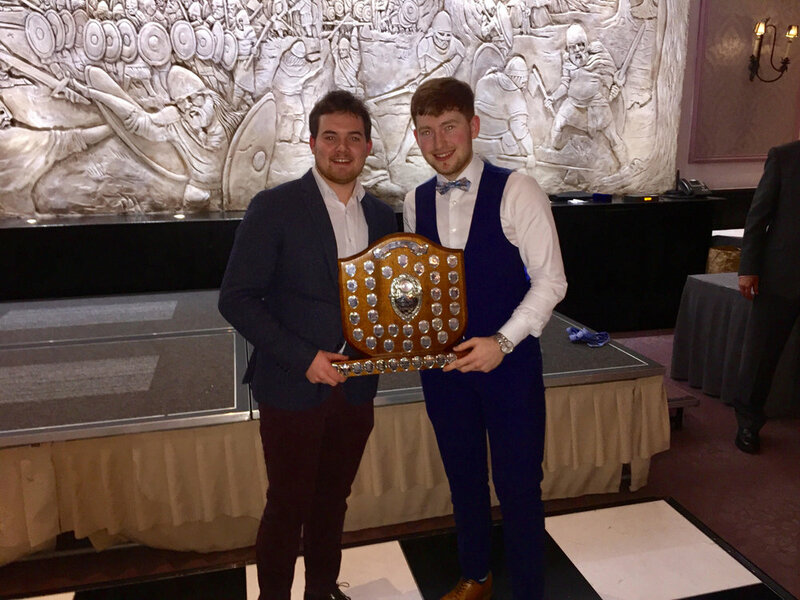 The awards that were given out were Senior Footballer and Hurler of the Year, Junior Footballer and Hurler of the Year and Young Player of the Year. Adam Wilson, Neil O’Flynn, Conor O’Donovan, Shaun Doolin (despite his absence) and Eoghan McKay each took home the awards. A huge well done to those. A huge thank you to one and all that turned out for, yet again, a wonderful evening. I know I speak for most when I say I am buzzing for next year! See below for a host of pictures from the evening. Some very exciting news! Juvenile mentors and devout Scoil members Jackie Geraghty and Sandra Curtin have orchestrated an amazing initiative called ‘Scoil Stars’. The programme is to help those with Specific Learning Difficulties and Special Educational Needs in the development of their GAA talent. This fantastic programme will be in place for most of the year and our senior players are asked to help out in any way they can as this development will be instrumental in developing younger players abilities. Dates and times are yet to be confirmed, though it will be beginning in February of this year. Please contact Jackie: 0872672038 or Sandra: 0872227056 for any information regarding this. Another mention must go to Ben McDermott, junior Scoil referee, as he will be refereeing during half time too. Congratulations Ben. Be sure to take lots of pictures and enjoy the evening! Under 8’s: Training continued on Saturday in the Alfie Byrne road pitches with pre match tactics being part of the training. Assistance from adult player Barry Cushin was greatly appreciated by both players and coaches. The hurling training paid off as the two under 8 Scoil teams once more played some great hurling in Gormonston College on Sunday morning in the comfort of the indoor venue. At the end of the matches Scoil had managed to keep the opposition from scoring. A couple of early goals from Gene settled Scoil into the games. Other players played a part in ensuring no goals were conceded during both matches. 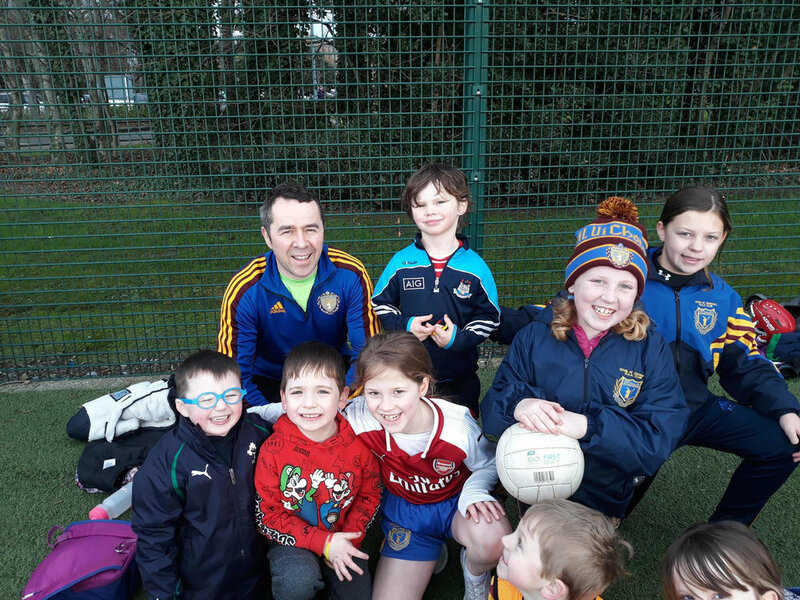 Jason, Shane and Aisling all stayed in their positions and did some great blocking of the oppositions ball on a number of occasions. Back to training on Monday in Larkin College this week. Nursery: We had great turnout for the Nursery last Saturday. We had over 20 blues, 8 greens and 16 yellows. The blues worked hard on their football skills this having spent the last few weeks working on their hurling skills in preparation for Gormanston. The green and yellows worked on their hurling skills. The coaches were really impressed with the effort the kids made. Players of the week were Donnach, Oisin and Tiarnan. Under 7’s: We had a great turnout for our second week at Gormanston indoor hurling event. Team A played Fingallians and did really well and fought hard with brilliant defending. Team B played St Pat's Stamullen and put on a great display with some great passing and striking. Well done to all the kids and more importantly the parents for getting them out so early! Under 11’s: Training kicked off in the early days of January once the boys went back to school. The Alfie Byrne Road pitches are proving a big attraction with really good turnouts on Mondays and Saturdays. We have also managed to fit in a couple of Wednesdays so the lads seem to be raring to go. We are starting games on 2nd February with an away hurling game against Wild Geese so this should good indication of whether they spent enough time practicing over Christmas or playing fortnite! The Scoil Junior trad session takes place in the clubhouse this Friday from 7-8. All are welcome. See you all there! The goalmouths on the main Scoil pitch are closed at the moment due to ongoing maintenance. Please refrain from using the main pitch during the winter months, if possible. Congratulations to Dillon Barnes on winning the ‘Last Man Standing’ event which took place amongst senior players. Dillon took home a voucher for €300.